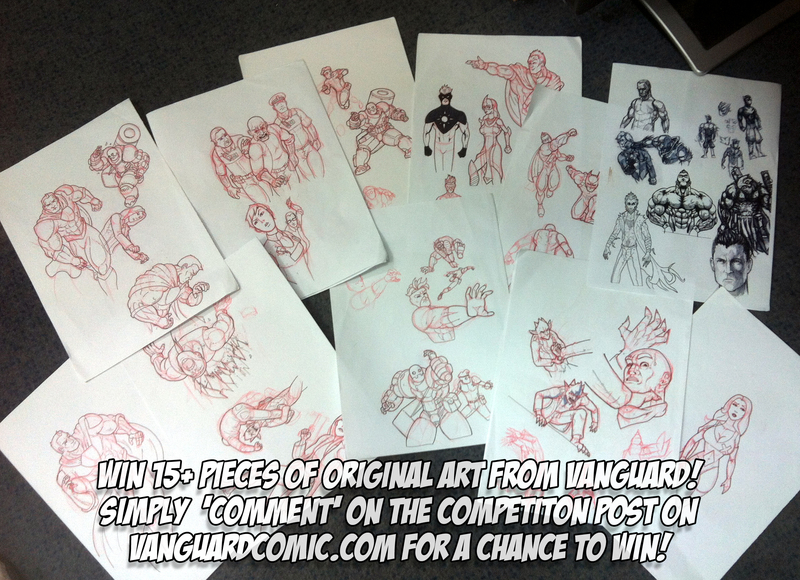 COMPETITION: Win 15+ pieces of Vanguard comic art! HOW TO ENTER: It’s simple. Just leave a comment in the section below. You could put what you enjoy about the comic, how you found out about Vanguard or simply put ‘hello’ or some such. The competition winner will be drawn on Wednesday the 31st of July at 12 noon GMT. The results will be simultaneously posted on this site, Twitter and the Facebook page. Make sure you check these on that date, lest you lose out! If you check the box ‘notify me of reply by email’ that’d be handy, as I’ll reply to your comment telling you that you’ve won! I found you through twitter and love the art! Hi, Dan! What a cool prize! that is so unbelievably cool! #nerdgasm! Brilliant art work, as always! Thanks for a chance to win such a fabulous prize. They’d go really really well with the Vanguard t-Shirt I already have… Cracking artwork fella! Brilliant series! Found you through the Collective of Heroes amd use Comic Rocket to let me know when new pages are up. As a Brit it is always great to see a British team. Now if they would just show the Yanks whose boss…. Don’t want to spoil things… but you may get that wish. This puts a completely different spin on superheroes to almost anything that I’ve ever read before. Thanks for making this webcomic! Awesome! I’m glad you are enjoying it Jordan! Hello or somesuch. I’ve been loving this on Drunkduck; it’s one of the best and most original superhero storylines I’ve ever seen.